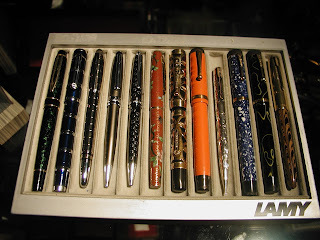 Dave M. brought in some fine examples, including: a Waterman Expert look-alike, MB Copernicus LE and MB StarWalker "clones", a cloisonné Hero fountain pen with a Parker '51'-like hooded nib, a Morrison lever-filler with an overlay reminiscent of a vintage Waterman, a vintage no-name Parker Duofold look-alike, a very Parker-like pencil made in Japan, some lovely Parker Duofold replicas (in colours not used by Parker) made by Chris Thompson, and a Parker '51' "homage" in rippled ebonite created by Howard Levy (of Bexley pen company fame). Dave also brought in a Parker '61' mark II set (made in Argentina, I believe) with two small metallic "dots" on the fountain pen's shell, in place of the traditional "arrow" for this particular model. 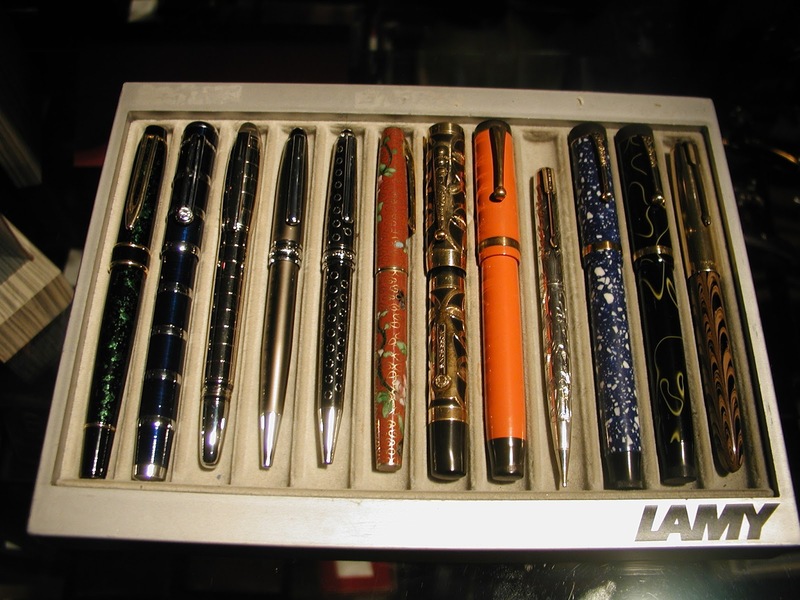 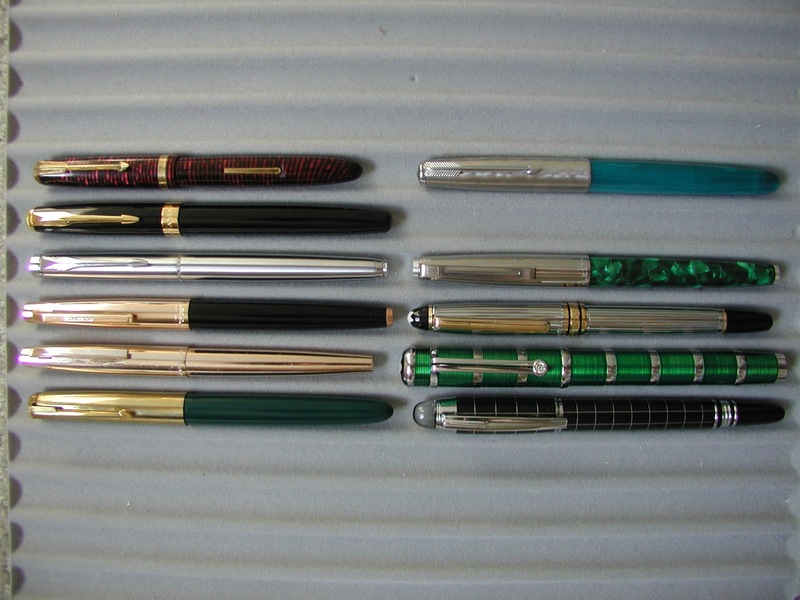 To demonstrate how vintage pen design has carried over to modern pen design, Bruce R. brought in part of his amazing Italian fountain pen collection (including: an OMAS Paragon with its Wahl-Eversharp Doric-inspired Art-Deco styling, a Visconti Wall Street made of Parker Vacumatic-like striped celluloid, a Visconti Metropolis with retractable nib that harkens back to the safety pens of the early 20th century and some cool vintage-inspired Visconti Voyagers), a lovely green Retro 51 'Double Eight' model (with faceted body, reminiscent of Art Deco-era fountain pens), a Bexley Americana (undoubtedly inspired by the Doric model), a TWSBI Diamond 540 (or was it a 580??) 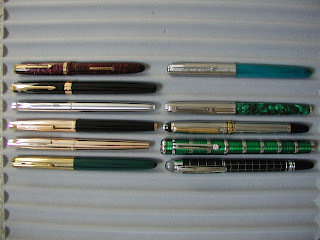 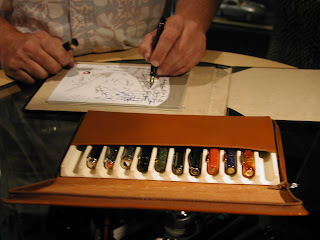 & CONID Bulk-Filler, pens which, Bruce claim, remind him of the iconic Pelikan M800 model. 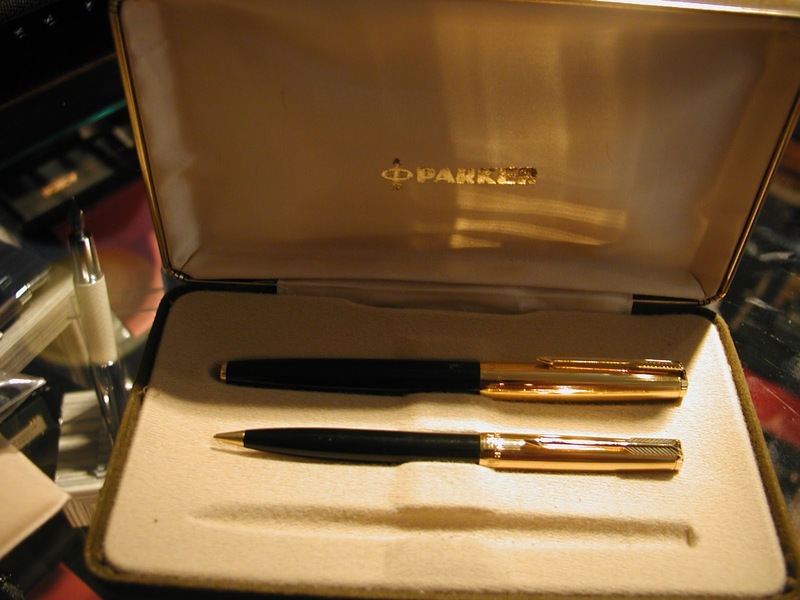 Important note: Our August meeting will be our annual summer dinner for VPC members (info in group email to be sent to VPC members within the next few days). Regular (themed) meetings will resume on September 19, 2013 at Perks pen store at 5844 Cambie Street (our usual place).